Palestine's Family Jewel: Why in the World Would Someone Willingly Eat a Testicle? One of the most highly publicized “new foods” for the 2012 MN State Fair are Holy Land’s lamb testicles otherwise known as lamb fries. Hearing about Holy Land’s latest contribution to the MN food culture piqued my interest. “How were fried testicles hailed as a delicacy and what in the world would the precious gems taste like?” I wondered. As with every meaningful interaction, I received my answers plus a greater respect and understanding of the impact one’s passion has on their work. Majdi Wadi, Holy Land CEO's intent is not simply to sell more food, but to share worldly experiences with his fellow Minnesotans, thereby bridging the gap between the us and them. Experience with my Pakistani husband/in-laws has taught me that there are many culinary delights beyond the ever so popular American meat standards of chicken breasts, salmon and steak. 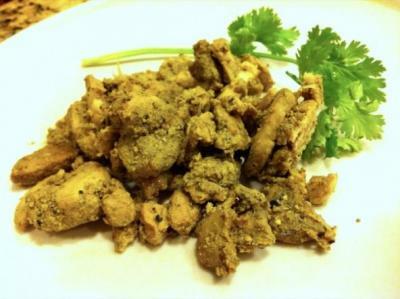 Places like Pakistan and Palestine have many unique dishes which include every conceivable part of the animal simply because access to food (namely meat) is much more challenging and the overall cost factor so great. A recent Gates Foundation study revealed that American’s spend roughly 8% of their total income toward the purchase of food whereas Indians and Ugandans spend a total of 56% and 75% respectively. To place a priority on a chicken breast or a tenderloin piece of meat to then discard the remaining parts of the animal is not only grossly inefficient, but highly disrespectful to the animal that has given it’s life for human consumption. With all parts of the animal consumed, delicatessen dishes are born in order to let each part shine. Wadi described a popular dish where the stomach casing of lambs or goats are stuffed with rice, vegetables and spices. I couldn’t resist: “I understand the minimal waste factor leading to the the use of lamb testicles as food, but there HAS to be some folklore associated with that body part!” I lamented. With laughter and the seriousness of a secret joke, Wadi explained that the testicles, along with hearts and livers are served to newlyweds the day after their wedding in order to build up their libido, so to speak. “I said, ‘But ma, I’m 21 years old, and I don’t need help with that!”, joked Wadi. Turns out that Minnesotans like the lamb testicles, or at least are willing to try something new. (They even made the Heavy Table's top 10 fair foods this year.) When Wadi conceived the new idea, he traveled to New Zealand, the world’s largest halal lamb producer, and procured 5,000 pounds of lamb testicles. By the 6th fair day, Wadi was running dangerously low. “We have an emergency shipment being sent from New Zealand and my trucks are now at the airport picking up that shipment,” exclaimed Wadi. Testicles are not the only souvenir brought to us by Wadi and the Holy Land family. I listened with great interest as Wadi excitedly described how he has searched the world for good foods he thinks his Minnesotan brothers and sisters might enjoy. “I have been in MN for 25 years and there is no other state in the US I would rather be and I want to share the world’s best,” said Wadi. "Last year’s fair food favorite was an Egyptian street food favorite, Kushari. The rice and pasta dish mixed with tomatoes and spices has reached high demand because I created a gluten free version, using quinoa-based pasta, to support my customers with gluten allergies." Holy land is often credited with giving Americans hummus. Launched at a MN State Fair years ago, hummus became so wildly popular that Holy Land hummus is now found nationally at Target and SuperValu and regionally at Costco. The grilled versionSo What did the Testicles Taste Like? I’m not going to be very original when I say that they were a bit like chewy, gamy, dark-meat chicken. Due to my party’s overly-enthusiastic interest, Wadi served us the fried version as well as the more traditional non-fried version. 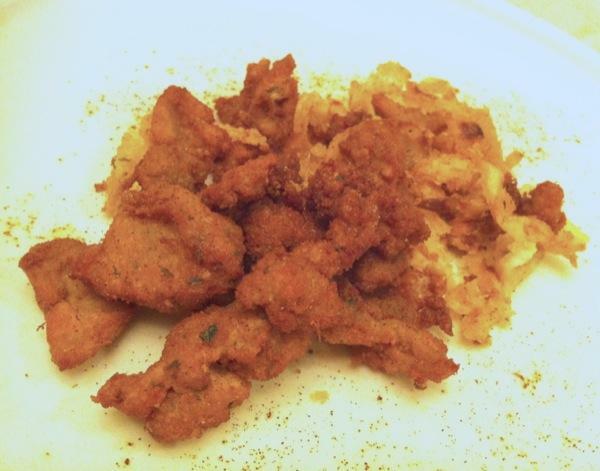 Side by side, I have to say the fried was good, but the non-fried even better; it allowed for the juices from the gelatinous texture to better mesh with the middle-eastern spices. Located at the International Bazaar, Holy Land’s State Fair foods are uniquely worldly and Minnesotan. So go, man-up, boost that libido and respect all parts of the animal. 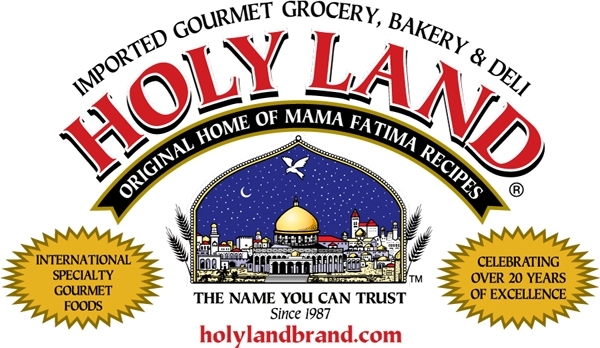 Special thanks to Majdi Wadi and Holy Land for taking the time to speak with me. Leigh Ann Ahmad was dragged kicking and screaming to the Cities by her husband; having been born and bred in Cleveland, Ohio, she just could not fathom how colder could be better. Now, five years and two kids later, she cannot imagine a better place to play and thrive. She’s a reformed carb-aholic, wannabe writer, social justice advocate, book-club geek, veggie grower and local foods connoisseur. Her last article for SGT was: Ishtar Time: The Thanksgiving and Mindfulness of Ramadan.